SSBD extraordinary tactical training weekend in the Netherlands with Maul Mornie. This event will take place on the 25th & 26th of May 2019. Here you will find all about the new location and about Hotels. This will be an Special 2 Days Open for Public SSBD Seminar with Maul Mornie. This is a must go for all Martial Artists! We are going to cover different topics and possibly different kind of weapons. We will have participants from all over the world joining this amazing event. Don’t miss it!! Register yourself on time so that you have a place for sure. We have limited places available so think fast! For fast thinkers (early birds) we have the coupons included (For those who register and pay in advance for the whole Seminar which means for both days) this offer will last until one week before the seminar starts until May 18th. After the 18th of May we will charge the prices for door tickets, please read below. The program will be presented on the day itself. Or I will announce the topics we will cover at least 2 weeks before the seminar starts. It also depends to the group and how fast the Participants pick up the drills we do to go more advanced into the skills. There will be short breaks to drink water and eat fresh fruits and we will have a lunch break on Sunday. We can provide you with our coupons at the registration desk for only €5,- per day per person, which includes water, fresh fruits, small snacks and unlimited lunch. The coupons can be used the whole day. But if you decide to join both days and you do the registration and payment in advance at least 1 week before this event starts than the coupons for the lunch and snacks are included. Door tickets are €80,- even if you have registered yourself and pay at the event. The €70,- per day is only valid if you pay in advance at least 1 week before the seminar starts. Deadline is October 26th, on this day the money need to be on the given account in the details of this event. Door tickets will be €80,- for the SSBD seminars even if you have registered yourself in advance and you pay at the event. So make sure you register and make the payment in advance if you want to get the regular price of the seminar fee what is mentioned above for this event. If you make the payment please write in announcements (SSBD Seminar) and how many days you’ll attend. And please write down your full name. This way we know that the payment is for the seminar and for how many days you will participate. On the day of the Seminar please report at least 30 minutes before the Seminar starts that you are there and come to the person who has the list with your name on it. The person who has the list can be Marcel Horstman or one of his assistants for that day. If you have registered and paid in advance than your name will be on that list. There is also a fill up form for the insurance what you need to fill up. Without filling up this form and paying for your fee it is not allowed to participate any of our SSBD Seminars. If you are a Group leader of SSBD from any Country than you’ll pay NO Fee. This is to show them respect for their dedication and for promoting SSBD to their country and for the loyalty to follow Maul and to come to us to train with us and share our passion. There will be also safety goggles, training knives, weapons, t-shirts and other merchandises for sale. Wearing safety goggles is required. There is no restitution possible after the payment. Because we had expanses for the seminar and all what comes with it to organize this event. In some cases we offer to come to the next Seminar, but cancellations need to be done 24 hours before the Seminar starts. If you cancel within 24 hours or less then you lose all rights. This entry was posted in Seminars on 06/04/2019 by Marcel Horstman. This entry was posted in Seminars on 15/03/2019 by Silat Suffian. 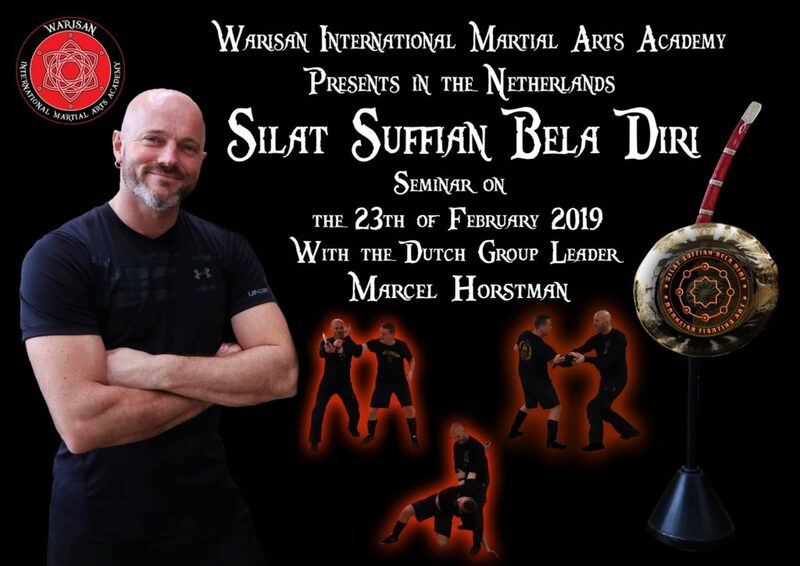 Attention: Saturday 23rd of February 2019 join Marcel Horstman SSBD Training Groupleader Netherlands at his Silat Suffian Bela Diri seminar! We from Warisan International Martial Arts Academy presents: SSBD Seminar in the Netherlands with the Dutch Group leader Marcel Horstman. This event will take place on the 23th of February 2019. Please read all. Here you will find all about the new location and about Hotels. Check also our Facebook Events This will be a 4 hour Open for Public SSBD Seminar with Marcel Horstman We are going to cover different topics and possibly different kind of weapons. Don’t miss it!! Register yourself on time so that you have a place for sure. We have limited places available so decide quickly! please read below. The program will be presented on the day itself. Or I will announce the topics we will cover at least 2 weeks before the seminar starts. It also depends to the group and how fast the Participants pick up the drills we do to go more advanced into the skills. For this day the rate is €30,- By registration and pay in advance. Door tickets are €35,- even if you have registered yourself and pay at the event. The €30,- for this day is only valid if you pay in advance at least 1 week before the seminar starts. Deadline is February 16th, on this day the money need to be on the given account in the details of this event. So make sure you register and make the payment in advance if you want to get the regular price of the seminar fee what is mentioned above for this event. How to register yourself and make the payment in advance and get the coupons included: Register yourself by email ssbdnetherlands@gmail.com and pay for the Seminar €30,- per day in advance at least 1 week before the seminar starts. This is really the deadline. After this week the rate will be €35,- p.p You can pay by Bank transfer to this account number: IBAN (NL70INGB0676857000) Foreigners who would like to pay in advance for the seminar need also this BIC code (INGBNL2A) This Bank account number + BIC above belongs to the account of M.Horstman If you make the payment please write in announcements (SSBD Seminar). And please write down your full name. This way we know that the payment is for the seminar and for how many days you will participate. Next to do: On the day of the Seminar please report at least 30 minutes before the Seminar starts that you are there and come to the person who has the list with your name on it. The person who has the list can be Marcel Horstman or one of his assistants for that day. If you have registered and paid in advance than your name will be on that list. There is also a fill up form for the insurance what you need to fill up. Without filling up this form and paying for your fee it is not allowed to participate any of our SSBD Seminars. If you are a Group leader of SSBD from any Country than you’ll pay NO Fee. This is to show them respect for their dedication and for promoting SSBD to their country and for the loyalty to follow Maul and to come to us to train with us and share our passion. There is no restitution possible after the payment. Because we had expanses for the seminar and all what comes with it to organize this event. In some cases we offer to come to the next Seminar, but cancellations need to be done 24 hours before the Seminar starts. If you cancel within 24 hours or less then you lose all rights. For any question please feel free to contact me through email: ssbdnetherlands@gmail.com or call/whatsapp +31619376747 (Marcel Horstman, SSBD Group Leader Netherlands) See you all soon!!!!! This entry was posted in Seminars on 19/01/2019 by Marcel Horstman. Second SSBD Seminar and 10 years Anniversary 1st & 2nd of September 2018!